After publishing the blog entry about the SS Edmund Fitzgerald earlier today, it seems like a good time to announce a related story. 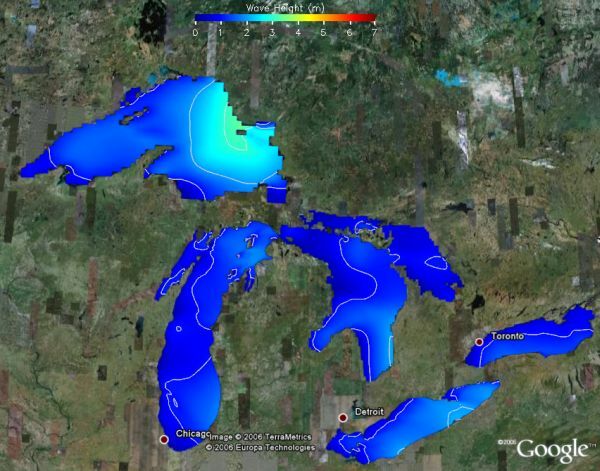 Greg Lang of the NOAA Great Lakes Environmental Research Lab wrote me yesterday to reveal their recent web page with several interesting GE KMZ files. First, they have two files which are updated 4 times per day showing real-time surface temperature of the lakes, and wave heights (I've already suggested they change these to network links). They also have a bathymetry file (depths) for the lakes. It's good to see another NOAA lab supporting KML/KMZ file types so more people can access this government sponsored data. I encourage governments in all countries to share important scientific and especially environmental data via KML/KMZ which is supported by Google Earth and other free virtual globe applications. Thanks for the beautiful Great Lakes pictures and information.